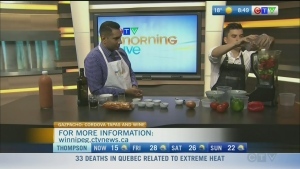 Red River College Chef Joseph Alex cooks up Three Sisters Soup, a dish to be featured at the new pop-up restaurant by Indigenous students. 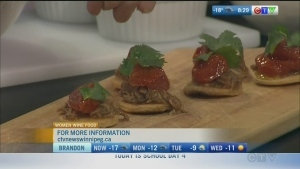 Chef Kelly Cattani makes tomato confit with pulled pork rib, a dish that will be served at an International Women’s Day event. 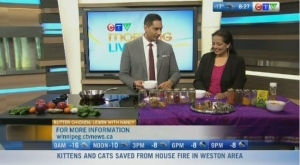 Nandita Selvanathan demonstrates the essential steps to making the popular dish of butter chicken. 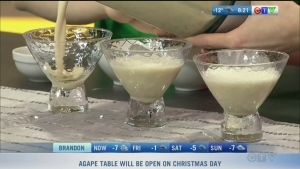 Nicole walks you through one of her favourite holiday recipes, and teaches us how to make homemade egg nog. 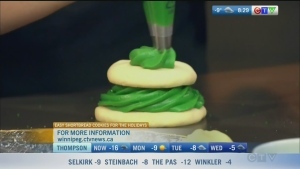 The holidays are busy times, so Katherine is showing us an easy bake recipe that will wow your guests and not take up to much time. 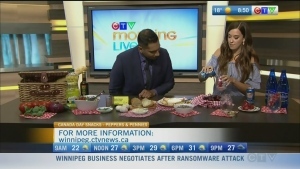 Tips and tricks on how to make the best Christmas inspired mocktails and cocktails. 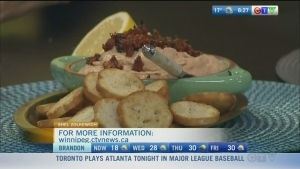 Gina Sunderland shows you how to whip up an easy summer meal that doesn’t require the oven. 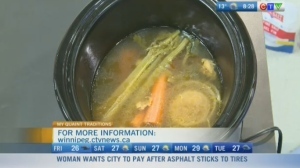 Ashley Pharazyn of My Quaint Traditions demonstrates how to make broth and different ways to use it. 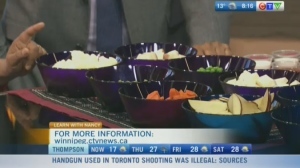 Find out how to cook up a tasty Indian dish that's also vegetarian. 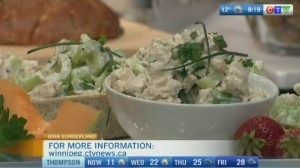 Dietician Gina Sunderland whips up an Asian chicken salad and chicken and brie crostini that doesn't require an oven. Shel Zolkewich makes some hearty salads that make a great barbecue side dish or stand-alone meal. 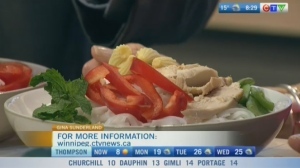 Find out how to whip up a spicy soup usually made from raw vegetables that will help keep you cool in the warm summer weather. 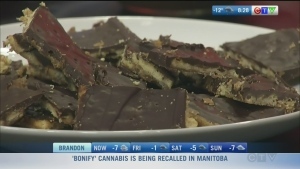 Canada Day is coming up this Sunday. 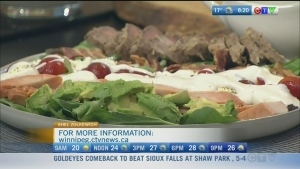 Food blogger Amanda Bibeau will cook up easy and affordable food that’s perfect for a Canada Day party. 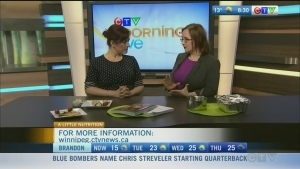 Registered Dietitian Susan Watson shares easy, quick meal ideas for two. 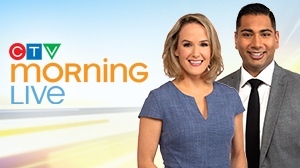 It's National Ketchup Day. 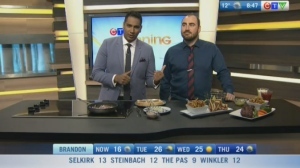 Chris Kirouac from Inferno's on Academy demonstrates how to make a Russian dressing for a reuben using ketchup. 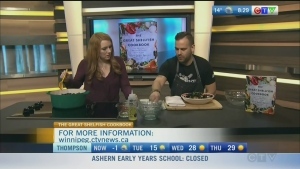 Chef Matt Dean Pettit demonstrates how to cook up some mussels and chorizo. 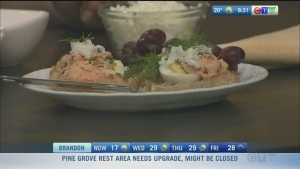 Manitoba Egg Farmers’ Brenda Bazylewski shows a spicy, yummy hard-cooked egg recipe. Say goodbye to the struggles of peeling hard-boiled eggs. 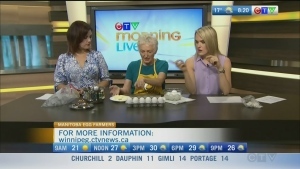 Manitoba Egg Farmers’ Brenda Bazylewski shows how to hard-cook the perfect egg.